Sunday night I wrote this post and hit publish and, in a rare turn of events for WordPress, it immediately disappeared into the ether. I didn’t have it in me to rewrite it that night, but I wanted to get it in today. 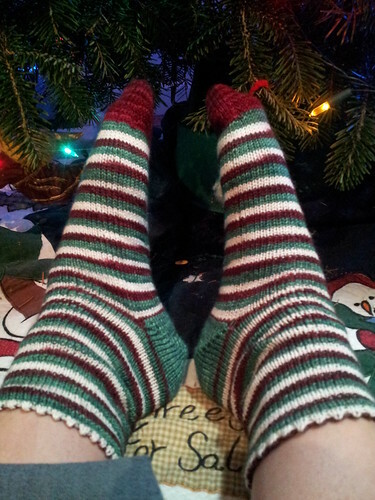 The main yarn is Beyond Basic Knits Stripey Superwash Sock in Vintage Holiday. The heels are knit from Hazel Knits Artisan Socks in Shannypants, left over from a hat I made an important baby five years ago. And I’m not certain, but the yarn I ended up using for the toes might have been Dye Dreams Dream Sox in Cranberry (but there’s a lot of ball left, which I think means it’s probably something else, with an AWOL tag). I used US 1s. 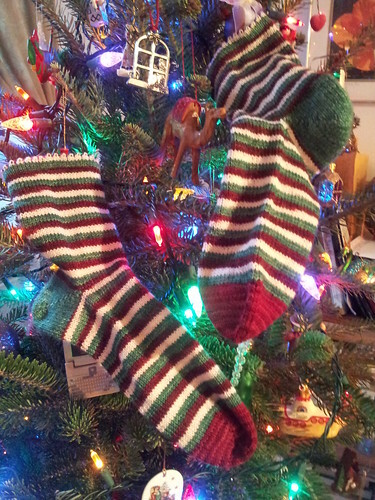 I started this pair of socks last November, knit through the holiday season of 2013-14 and put the socks away just shy of the toe, because I couldn’t find yarn that matched the red stripe. 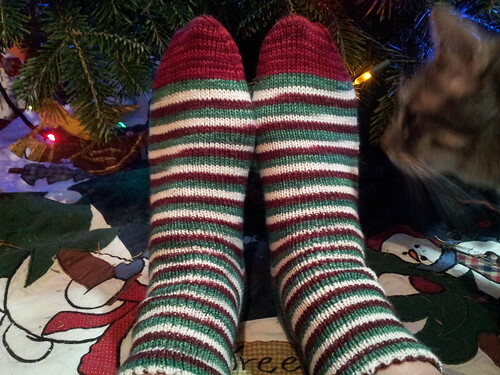 I picked them back up in August, and finished the first sock that day. I knit the second sock off and on in October, but put off Kitchnering the toe until right before Sarah and Megan’s Christmas party on the Solstice. Yes, I am lazy. The stripes match and I’m pleased with how they turned out. The Vintage Holiday was a short skein I picked up at a fiber festival Sarah and I went to a number of years ago, and I didn’t want to run out of yarn, so I made the first sock leg shorter than I usually opt for. As it turns out, with the toes and heels knit out of other yarn, I had more than enough and could have gone for my usual length, but it’s fine. If I lived in New England, I’d have to come up with a way to tack a couple inches in there to make sure my legs weren’t cold. 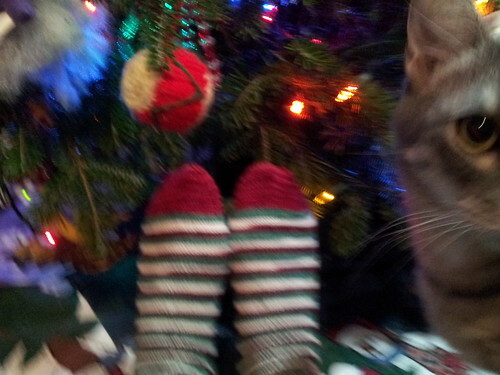 Since I live in D.C., though, our December weather is still mild and short socks are fine here at this time of year. Corey thinks I should have knit him something instead. Category: knitting. There is/are 2 Comments. Send out the last of my Christmas cards. Mail at least one package. Finish at least one more book. Rewrite last night’s blog post (that somehow got eaten by WordPress instead of published). Start a new knitting project. Sign up for some January projects/programs/activities. How about you? Are you still off from work? How are you spending your time? Category: life -- uncategorized. There is/are 1 Comment. Happy Boxing Day! Did you have a relaxing day after Christmas/Friday? I did. I didn’t leave my parents’ house. I read two stories from one of the new books Rudi gave me for Christmas (My True Love Gave To Me (appropriate, right?! 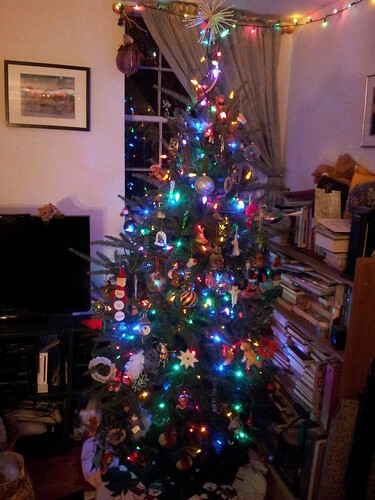 )), hung out with loved ones, did a crossword puzzle, made a batch of cookies, ate leftovers, and watched The Hundred-Foot Journey (which we all enjoyed and heartily recommend). I did not wrap a single present, drive long distances, get up early, or do any shopping. It was lovely. Category: arts,books. There is/are 1 Comment. 1. We spent the day surrounded by family (in person and remotely). 2. We ate delicious food — turkey, stuffing, trifle, chocolate. 3. Everyone seemed to like the gifts we gave them — and we got awesome gifts ourselves. How about you? What’s been beautiful in your week (or holiday) this week? Merry Christmas to those who celebrate, and merry Thursday to all the rest! Category: three beautiful things. There is/are 1 Comment. 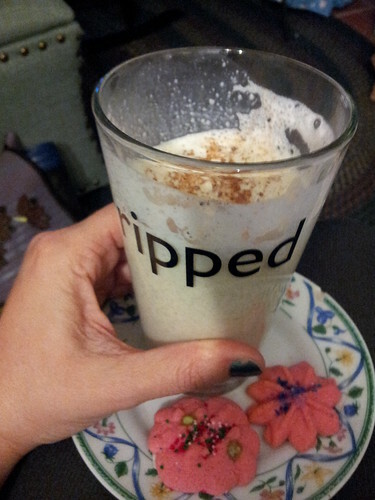 Those would be the last few Spritz cookies from the batch Mum made me at Thanksgiving (they get doled out sparingly after the tree-trimming party to help them last) and egg nog from our local dairy. Category: life -- uncategorized. There is/are Comments Off on prepping for christmas. Wishing you more light — in all forms — in your life. Category: life -- uncategorized. There is/are Comments Off on happy solstice.